In this page wrenches will displayed for the enjoyment of all visitors and contributors . Wrenches of all types will be featured here , and will change from time to time at the discretion of the site moderators . 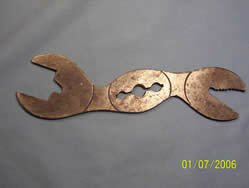 Odd wrenches , rare wrenches , anything of place holder imageinterest may be found here . Visitors are invited to add to this page by contacting Papawswrench with ideas , suggestions , pictures , or other material . When available patent drawings , ads featuring wrenches , etc. may be found here . Be sure to honor any and all copyright rules if 3rd party pictures or text are to be attached to a submission . 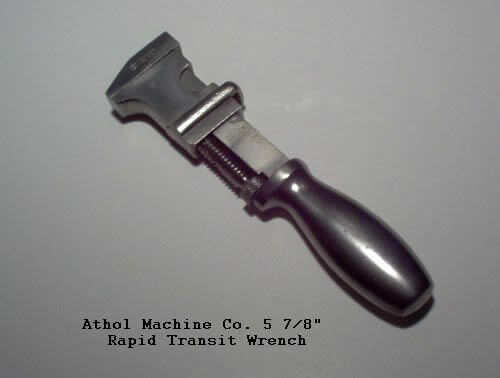 This wrench is a Rapid Transit screw wrench made by the Athol Machine Co beginning in 1892 . Made under patent of Stephen Bellows , June 8th , 1880 . Called a rapid-transit wrench , it had a plunger which when pressed released the jaw so as to slide it up or down quickly , to make the job quicker . I have just recently acquired this example in excellent condition . I bought one of these on Ebay some years ago , not knowing what I had bought and sold it quickly for about $30 , only to find later it was a $100 wrench ! The following tale is from the Stillson family homepage to whom we are indebted for this excerpt. Col. Levi R. Greene, who served his apprenticeship in the Corliss Engine Works before the Civil War, and who was an engineer on a naval vessel during the Rebellion, had, as a fireman of the craft, a young man named Daniel Stillson, who appeared to possess unusual mechanical ability. In 1865, Colonel Greene entered the employ of the Walworth concern, and much to his surprise, Stillson appeared one day seeking a job, and was hired as a mechanic at the Cambridgeport plant. In 1869, he came to the office with the pattern of a new type of pipe wrench, which he had whittled out of wood. Greene was interested and authorized Stillson to have a wrench made of steel, after his model. When next he appeared Colonel Green and C.C. 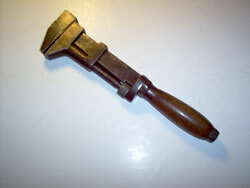 Walworth examined the wrench and finally Stillson was directed to the pipe room, in the Devonshire Street shop, and was told to try the device on a section of 1 1/4 inch pipe. "I want you to put strength enough on that wrench," said Colonel Greene, "to twist off the pipe or break the wrench. I don't care which." Colonel Greene in telling the story years afterwards, said: "Dan looked at me with some strong language in his eyes. He was competent in use language, chiefly profane, and he exercised this accomplishment on frequent occasions." C.C. Walworth chucked as Dan turned on his heel and walked out of the office. Half an hour later, he came back with a piece of the pipe which had been twisted off. His wrench was intact. C.C. then became really interested and told Dan "to go back to the factory and have the forman make up two dozen wrenches." continued Colonel Green. "He and I agreed upon suggestions as to the length of the handles for different sizes and Dan went away. He came back with the finished wrenches a few days later and was advised to go to the Patent Office and get a patent for his invention. "It is as much as I can do to get my dinner, to say nothing about going to the Patent Office," said Dan. C.C. Walworth, however, thought so well of the wrench that he authorized Stillson to draw upon the office for the necessary expense money and directed him to a patent lawyer, who had served the company. In the course of time, Stillson came back with his letters patent and asked Colonel Greene's advice as to how he should proceed. Stillson's first thought was to sell the patents to J.J. Walworth & co. his need of money was so great that he believed $2,500 was worth more to him at that time than possible royalties in the future. Both Colonel Green and C.C. Walworth advised Stillson against selling his patent and even when the inventor fixed $1,500 as his price for the patent right, they urged him to adopt another course. Stillson finally took their advice and agreed to grant the exclusive manufacturing rights to J.J. Walworth & Co. In return he asked for a royalty percentage which, according to Colonel Green, made the sale of the wrench absolutely prohibitive in price. However, he was adamant and the company accepted his proposition and entered into an agreement to manufacture and sell the wrench at the figure named. The trade was thoroughly informed of the possibilities of the new invention, but the wrench did not sell because the price was too high. After months of waiting, Daniel Stillson was persuaded to accept a royalty which permitted the manufacture and sale of the wrench at a more reasonable figure, and thereafter the Stillson Wrench was a marketable product, and became one of the worlds best known inventions. The Collins Mfg. Co. was founded in 1826 , and incorporated as the Collins Co. in 1834 . 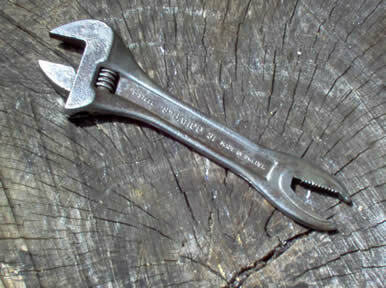 They made monkey wrenches patented by L. Jordan and L.E. Smith in 1865 . They also used Luke Chapman's patent of 1869 , 1870 , and 1881 . Wrench patents granted to Chapman in 1872 and 1873 resulted in litigation with Coe's . Details of that litigation are shown in Ken Cope's book , "American Wrench Makers ". 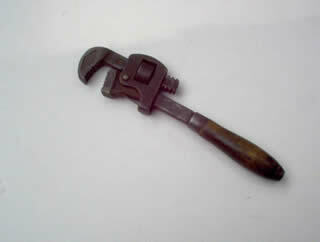 A wrench like the one shown here was pictured in Scientific American in 1867 . I was sent this pic by a guest on Tool Talk and have not identified the maker , S&T . If anyone viewing this knows something about it , please email me or post on the Tool Talk Forum about it . My first alligator wrench was in the form of an adjustable wrench I acquired in the tool kit of an old Volo car I bought in 1969 for $25 and an old twin-lens reflex camera . I bought the car from a guy leaving for Canada to avoid the draft . I never heard from him again . The wrench is still in my toolbox and I use it regularly . It was some years later that I found out about Bahco . Here is some info from their website . In 1862 Göran Fredrik Göransson founded Högbo Stål & Jernwerks AB, Sweden, producing high quality steel using the Bessemer Process. From this beginning he then developed into producing saw blades, starting in 1886. Saws that were of the same high quality as the steel they were made from and performed to the expectation of their users. As today the saws and all other tools were marked with the "Fish & Hook" brand as a symbol for the highest quality. These were the beginnings of product innovation and design that still prevail within the company today. In 1891 his next patent was the very first adjustable spanner. This was the basis for the adjustable wrench, as we know it. A Swedish invention found all over the world that we have produced in more than 100 million examples - so far! Before he died in 1943 J. P. Johansson held no less than 118 patents for innovative products. 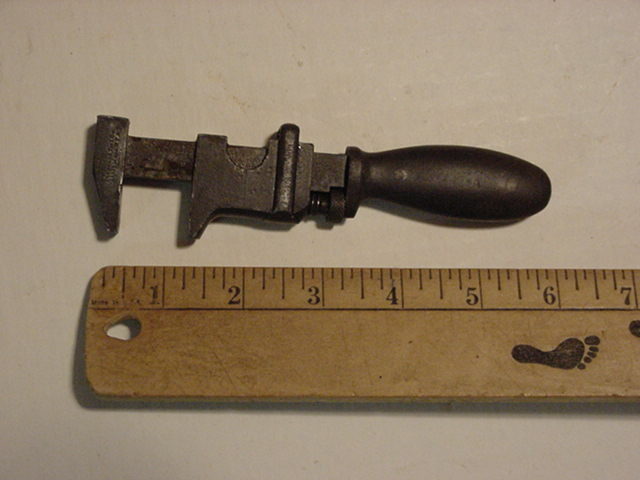 Here is an example of the wrench , and it is still being sold today , with improvements . In 1890 Berndt August Hjorth acquired the sales and marketing rights for products from Enköpings Mekaniska Verkstad. His entrepreneurial skills ensured that the company became more than just a local Swedish success and laid the basis for the international company that Bahco Group is today. Combining global products with local market knowledge and expertise so that users everywhere find the product they need to do the best possible job.